Testing and measuring the results of your marketing allows you to generate tangible information which you can use to guide your future marketing plans. If you don't record any information, you'll have no idea how effective your marketing is. How can you decide which methods to stop using, and which to continue with? Some marketing methods are easier to evaluate than others. For example, if you use a system like MailChimp or Campaign Monitor for your email campaigns, you can generate detailed reports on the number of people who opened the email, and what links they clicked while they were there. Other tactics such as PR are harder to quantify. 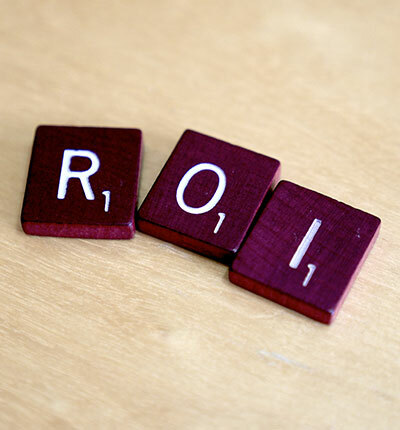 It's a good idea to set up a system to test and measure your marketing ROI. It needn't be complicated, especially if you're a sole trader or small business owner. You'll need a bit of discipline to operate your system until you've gathered enough information to come to meaningful conclusions. You don't need an expensive bespoke system to record this information – a simple spreadsheet will suffice. If you're planning a direct mail campaign, for example, make sure you include some sort of code on the card or letter, so you can trace any interest back to this specific mailing. Test it on a small targeted group first and check the responses before sending out the larger batch. This way you'll be able to fine-tune your approach, perhaps trying out different text, offers or calls to action (marketers call this A/B Testing). The method should be appropriate and easy to measure. For example, if you run an online competition to increase your followers on Facebook, make sure you measure the number of followers before and after (i.e. use basic common sense!). Whenever we get new enquiries, we ask people how they found us. A large proportion say they found us via a Google search – so we know that we need to continue our SEO efforts and Google AdWords campaigns. Make sure you record this information on your spreadsheet, whether or not the client ultimately buys from you. You can drill down to find out exactly what people are reading, and what they are responding to. Once you have all this data in place, you'll be able to evaluate what you're doing and confirm the effectiveness (or otherwise) of your marketing activities. If they are not working as you had hoped, you can fine-tune, try different approaches, or take the decision to stop a particular activity altogether. When it comes to allocating your marketing budget, there’s no one-size-fits-all answer. Each company is different. The key is to compare the tactics you're using and make budget allocation decisions accordingly. Then, develop a sound strategy to optimise the most effective channels for your business.